Curt Goodrich | 3…2…1…blast off! There it is. The new 15′ exhaust stack is up and working perfectly. 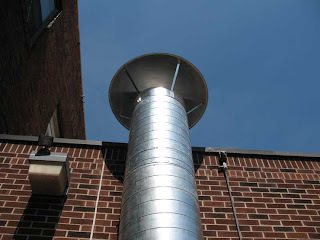 The duct is 24″ in diameter so the rain hat needed to be 36″ is diameter to effectively keep out rain and snow. Between this project, funerals and illnesses my time at the bench making frames has been limited this last 2.5 weeks. Yikes! Oh well, that’s family life.